Smaller than MicroUSB and more powerful. That’s the message from the USB Promoter Group who have finally finalized their Type C connector. It looks to be a little smaller than MicroUSB, or about the size of a Lightning connector. From the renders, it seems a little more durable than MicroUSB and can now be inserted either side up like a Lightning cable. USB runs most of the world’s mobile devices (Apple being the sole major holdout) and news about a new USB connector is big news indeed. It’s not that the current MicroUSB standard is so awful, but yes, we all put it in upside down about half the time and if you’re actually using the thing as a data cable, it’s not terribly fast. The new Type C connector is double-sided (as we said) and can send data at the same speed as USB 3.1, ten gigabits per second depending on the ability of the devices to send and receive that fast. That should put the issue of speed to rest for some time. 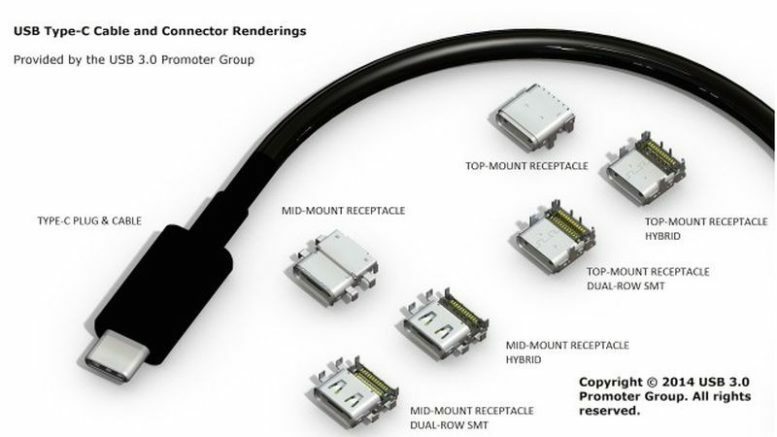 It’s a bit of a disappointment that the connector isn’t a “paddle” type like Lightning which would have made it more durable and dust-resistant (two things that current connectors are not.) However, it makes sense to hide the contacts since the new connector could carry up to 100 watts of power. It’s not clear why the USB Promoter Group thought it would be necessary to run floodlights off a USB connection but that’s their call; it does mean there’s a reason to hide the contacts on the connector to be as safe as possible. It will still likely be a year or more before we start seeing this new connector on any device, but if the public and device manufacturers embrace it, you’ll see smaller yet faster connectors on everything by this time in 2016. Will the PC be this year’s hot tech purchase?